No need to jump, slow motion and full control. 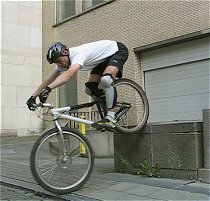 This technique is fun to try out on steep obstacles or down vertical steps that are not too high (else the crank suffers). 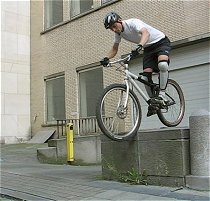 The higher the step, the slower you should go or you risk to go over the bars. You just need to hold on to the bars and keep your bum as far as possible behind the seat. In some cases, you'll nearly end up bouncing on the front wheel. 1° Release the front brake very slightly to let the front wheel roll down progressively over the egde. 2° As the front wheel rolls down along the step, extend the arms to the max and keep your bum above the rear tyre. 3° Once the front wheel has touched down and rolls away, control the rear wheel descent using the front brake. Approach the step at very low speed, stop with the front wheel just on the edge. bum above the rear tyre. This move can be quite tricky if there are some terrain irregularities behind the step you roll down. Because the front wheel can be stuck in a ground recess and make you trip over the bars. 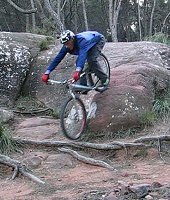 If the front wheel gets stuck, make sure that you stay in balance with your bum as far as possible behind the saddle. Then, with brakes full on, you can try to hop the front wheel away from the trouble zone. In a rocky zone, rolling down takes a lot of precision. The bike will follow easily the front wheel. But you must choose your line very carefully. Try to avoid having the front wheel stuck. So for example, just extend the arms to bounce the front wheel over possible obstacles, so that the front wheel rolls over them instead of getting stuck.